Educational technology equipment requires a plan consists of pedagogical and technical scripts to guide the implementation of technology-enhanced learning. We, therefore, intend to provide a solution by constructing a guidebook for teachers in developing content for school’s digital signage. The project involves concepts of creative collaboration and co-designing in a framework of 21st-century education, to support the children of an elementary school to display their artwork using the digital signage provided by the school. Teachers take the role of facilitator and assistant in the learning process. With the plan, we can invoke the well functioning learning environments to promote interaction, participation and community building of knowledge as emphasised by Finnish National Core Curriculum for Basic Education 2014. 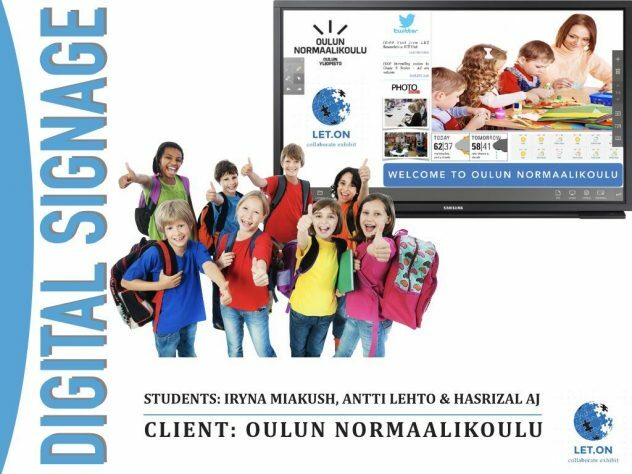 Oulun Normaalikoulu is upgrading and expanding their digital signage televisions around the school. One of their intentions is to set up a ‘Live Feeding Display’ for students to stream presentation or activities in the classroom around the school, using the digital signage. This is aligned with the message from Finnish new curriculum: Well-functioning learning environments promote interaction, participation and communal building of knowledge (Finnish National Core Curriculum for Basic Education, 2014). Our project is to produce a guidebook for teachers in developing content for the digital signage. The guidebook consists of both pedagogical and technical scripts, based on the 21st-century educational framework, creative collaboration, and co-designing. Ananiadou, K., Claro, M. (2009), “21st Century Skills and Competences for New Millennium Learners in OECD Countries”, OECD Education Working Papers, No. 41, OECD Publishing. Craft, A. (2012). Childhood in a digital age: creative challenges for educational futures. London Review of Education, 10(2) pp. 173–190. Eteläpelto, A., Lahti, J. (2008). The resources and obstacles of creative collaboration in a long-term learning community. Thinking Skills and Creativity, 3 (2008) pp. 226–240. Finnish National Board of Education (2014): The National Core Curriculum for Basic Education. Niemi, H, Multisilta, J., Lipponen, L., Vivitsou, M. (Eds.). (2014). Finnish Innovations and Technologies in Schools: A Guide towards New Ecosystems of Learning. Rotterdam: Sense Publishers. Layng, T. J., & Twyman, J. S. (2013). Education+ technology+ innovation=learning. Handbook on innovations in learning, 133-148. Starkman, N. (2006). The wonders of interactive whiteboards: No cutting-edge classroom is complete without one. THE Journal (Technological Horizons In Education), 33(10), 36.